HARARE, May 1 2013 (IPS) - Mollin Siyanda, 46, a single mother of three from Harare’s low-income suburb of Hatcliffe, is scared of being arrested by the council police as she sells fruit, vegetables and second-hand clothes on the pavement of the city centre without a permit. “I take the (fruit and clothes) to the city centre to resell on the street pavements during evenings at peak hours as people are rushing back home,” she says of the goods she purchases every day at Mbare Musika, a major market in Harare. “But I’m always operating under constant fear of council cops who often accuse me of being an illegal vendor,” Siyanda tells IPS. Selling goods without a licence from the Harare council authorities is illegal here. But a licence costs 20 dollars, which is a large sum to the many working in the informal economy who earn on average between two to five dollars a day. According to Philip Bohwasi, chairperson of the Council of Social Workers in Zimbabwe, the country’s unemployment rate is 84 percent. As a result, a great majority of people currently work in the informal sector, and hundred of vendors have set up their stands at undesignated points across the city. Siyanda’s story is one example of the situation that a number of Zimbabwe’s working women constantly face. 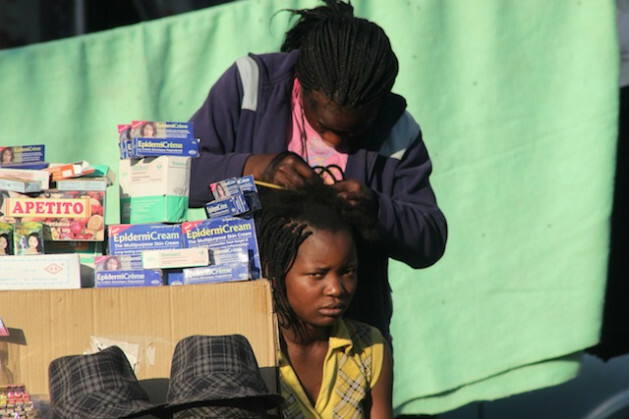 According to the Zimbabwe Congress of Trade Unions (ZCTU), over 60 percent of Zimbabwean women working in both the formal and informal sector are now the breadwinners in their families, as their husbands have succumbed to HIV/AIDS or were retrenched from their jobs. “It’s true that women have become breadwinners. Some women have been widowed or their husbands left for greener pastures or were retrenched, leaving their wives to venture into the informal sector,” says Fiona Magaya, gender coordinator for ZCTU. Ahead of May 1, International Workers’ Day, women trade unionists in this Southern African nation have called for government leaders to recognise informally-employed women. “There is need for proper recognition of the informal sector and the role it is playing in the country’s economy, and government should move swiftly to regulate the informal economy, which employs the bulk of women,” Magaya adds. Hillary Yuba, from the Progressive Teachers Union of Zimbabwe, echoes Magaya’s sentiments. “Women clung to their small jobs even after dollarisation came, but scores of men lost theirs. Hence we now find women turning into breadwinners,” Yuba tells IPS. In 2009, Zimbabwe introduced a multi-currency regime, where transactions are now carried out in the United States dollar, South African rand and Botswana pula, to beat hyperinflation under the Zimbabwean dollar. “Government is certainly not looking into these problems,” she says. ZCTU information officer Khumbulani Ndlovhu says poor remuneration in the formal economy has forced women to venture into informal businesses. “Even formally-employed women are in the informal sector, working in casual jobs to supplement their wages,” Ndlovhu tells IPS. However, the government says a shortage of funding has hampered its efforts to economically empower women in both sectors. “There is a lack of prioritisation of funding of key ministries like the ministries of women affairs, gender and community development …. and small and medium enterprise development,” a top government official from the ministry of women affairs, gender and community development tells IPS on the condition of anonymity. A veteran female trade unionist from the Zimbabwe Union of Journalists, Sheila Mahlathi, says: “The fact that women have become major breadwinners calls for leaders to recognise they should also be given positions of authority, not through affirmative action, but by realising that, just like their male counterparts, women can also achieve extraordinary things. “Authorities should make sure there are designated places for women to work unhindered as they fend for their families in the informal sector,” Mahlathi tells IPS. One successful female entrepreneur in the informal sector, 34-year-old Ashley Zijena from Harare’s Southertorn middle-income suburb, urges women to remain resilient in the face of challenges. Zijena, who operates eight flea market stalls selling imported clothes in Harare’s Machipisa low-income suburb, tells IPS that on average she makes between 60 to 80 dollars a day. “Women should stand up and occupy as many political and economic positions as possible,” she says.